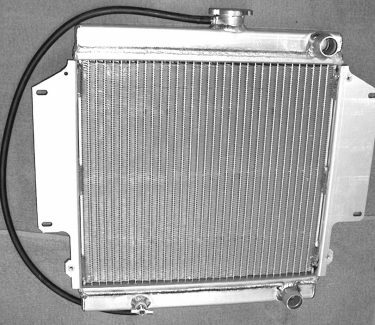 SUZUKI SAMURAI 1.3 RADIATOR – ALUMINUM CORE/PLASTIC TANK – 2-ROW — 14.75 x 14.88 x 1 in. core size, 1.56 x 14.94 in. inlet and outlet header, 1.09 in. inlet and outlet size. 100 percent leak tested. Made with the highest grade of materials to ensure product longevity. Manufactured under ISO 9001/TS 16949 quality system. Tested in an endurance simulator in order to exceed OE standards. Includes 2-year warranty. Core Dimensions: 14.75 x 14.88 x 1 in.